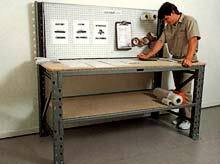 Workbenches are available for both heavy and light duty applications. They can be designed with casters for mobility, with an optional high back with board placement for a variety of needs such as; whiteboard, or tool and parts shadow board. The overall dimensions are not fixed and can be designed for specific needs. All variables such as height, length and depth of the workbench can be designed specifically.